18th Sept. 2018 - Colin started again from Snowdonia, Capel Curig, but bad weather ahead ! 29th July 2018 - Colin will be taking a forced break for a few weeks for medical reasons - but will return to Snowdonia to continue his journey to Lands End in a few weeks. .Happy & Proud - Why not !! .Sore feet - Why not !! Colin has changed his strategy (Day) and not attempting to cover a marathon a day, but Sarah and Colin are making b&b / tenting arrangements on a daily basis, mostly with the generous help of fellow Rotarians from clubs along the route. Well done Sarah and thanks to fellow Rotarians. Thank you to my Bodmin Rotary supporters, I have had some extremely generous gifts that will help me to complete the epic challenge, also some fantastic donations to ShelterBox online and offline. 'Just Giving' has collected almost £500 for Shelterbox so far. 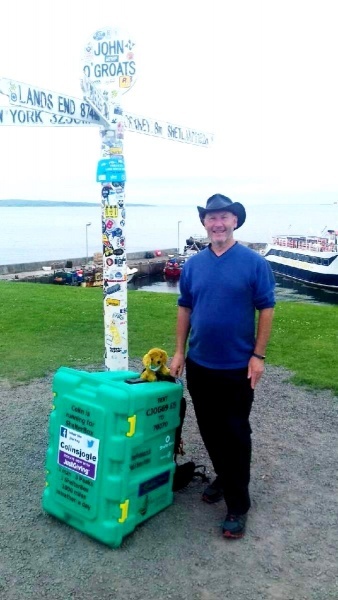 Colin Bell, a member of Bodmin Rotary Club, a very active volunteer with ShelterBox and a passionate runner has embarked on a new challenge. 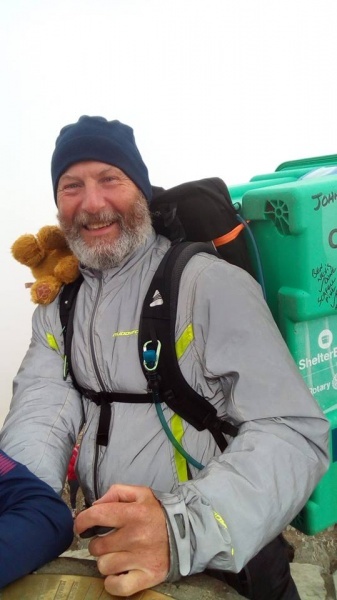 During 2015 Colin set a challenge to run 2015km, about 48 marathons distance and if that wasn’t ambitious enough, he completed some of it carrying a large green ‘ShelterBox’ strapped to his back, all to raise money for the Cornish charity, ShelterBox. 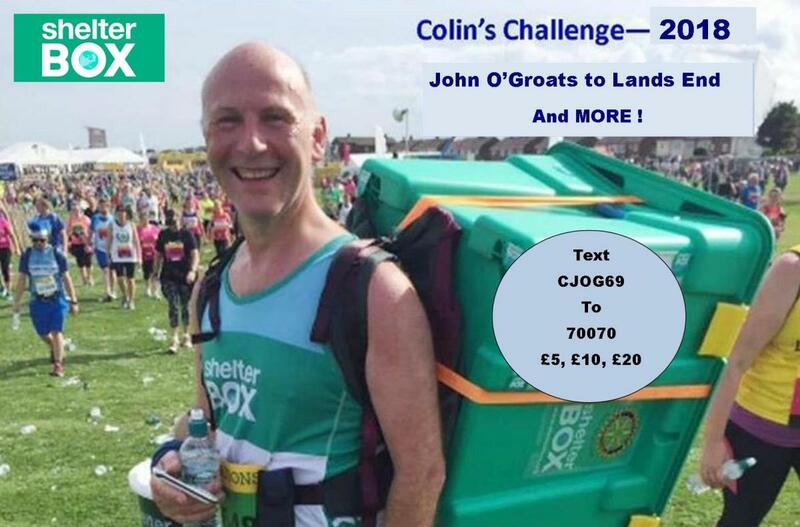 Colin's latest personal challenge is to run from John O’Groats to Land's End again with a ShelterBox strapped to his back. 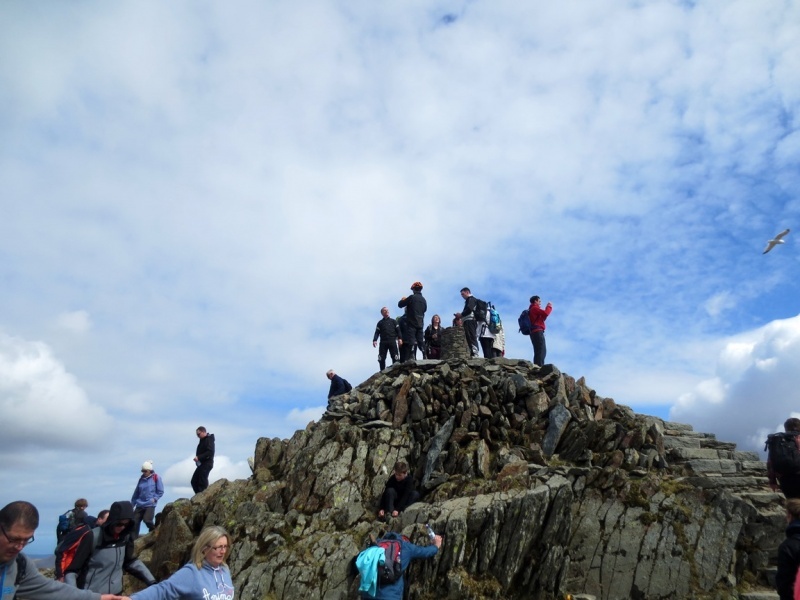 But this is not challenging enough, so he intends to complete the ‘Three Peaks’ along the way, visiting the mountains of Ben Nevis in Scotland, Scafell Pike in the Lake District and Mt. 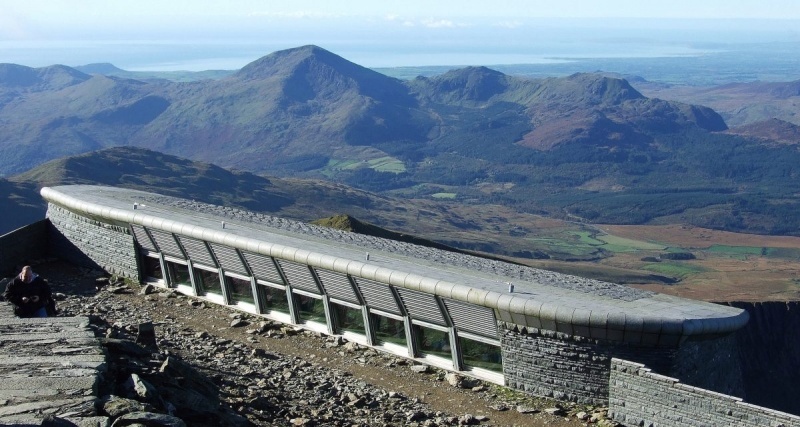 Snowdon in Wales – all adding to the total distance to be covered. As a combined venture this has never been done by anyone before and amounts to approx. one marathon each day, a distance of over 1000 miles, a total of almost 40 marathons. The challenge will take place starting at John O’Groats on June 10th 2018 and finish at Land's End hopefully on July 23rd 2018. Colin is getting support from friends along the route and being monitored by Shelterbox. Also hoping to get sponsorship and donations from other Rotary Clubs and friends as he progresses towards Lands End. Please sponsor Colin on this brave challenge, all to raise funds for ShelterBox.